We've got a great page on Facebook with lots of photos and links to our work on photography sites and other blogs. Check out Mariah Nicole Makeup & Hair Artistry here. 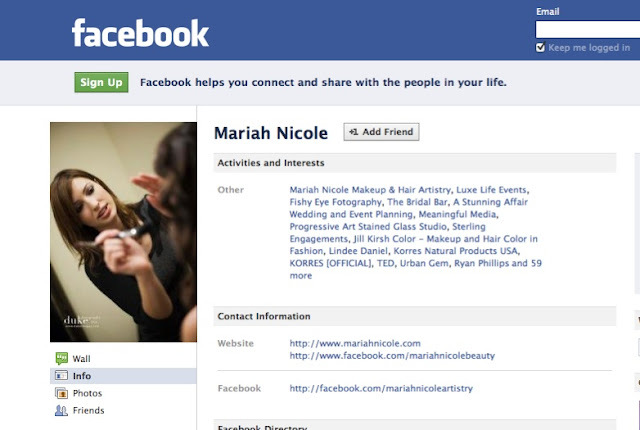 You can also "Friend" Mariah Nicole on Facebook, and get updates on shoots, weddings, and see even more pictures from makeup and hair jobs! It also is a great way to get to know Mariah before you book your event. Wollen Sie Esel Karneval Kostüm kaufen? Suchen Sie nicht weiter, kaufen Esel Kostüme online bei karneval-karnevalkostuem-karnevalskostueme.de und bekommen es zu Ihrer Haustür geliefert. Thanks for sharing such a great information .Am looking forward for your net post . hi...keep spirit. success you . Brilliant article! Thanks for sharing your experiences. Günstige Karneval Kostüm Shop - Halloween Costume Stores Online in Deutschland.